Scoring goals has never been the knock on Brandon Pirri, he’s always been able to do that. Yet, since being drafted in the 2nd round in 2009 he’s played for five different teams, has cleared waivers twice, and was released from a PTO in Florida prior to last season which led him to Vegas (really, Chicago). The question is, why? The first part isn’t anything new, he’s simply always been seen as a defensive liability, but it was the other portion that piqued my interest. It wasn’t just this interview either that Gallant mentioned skating, strength, and conditioning as factors in holding back Pirri. He’s said it in press conferences and in a few other one-on-ones. Pirri has rapidly risen from fill-in to waiver yo-yo to a bonafide top-six forward for the Golden Knights and it’s all happened within a month. Gallant has even compared him to Jonathan Marchessault, who was a later bloomer himself, not getting his start in the NHL for good until he was 26. Pirri appears here to stay as he’s passed the threshold of games allowing him to go back to the AHL without clearing waivers. The question remains where does he fit in the Golden Knights lineup when everyone returns to health. Originally the idea of him playing outside of the top six seemed outlandish, especially with the way Gallant was using him early in the call-up. But with all this talk about defensive responsibility, strength, and conditioning, one has to wonder if maybe he’s ticketed for the third line. He’s played nearly six minutes of 3rd period time in each of the last three games and has been on the ice for 14 defensive zone draws in those three games after only being in the D-zone for 17 in his first seven games. The more he plays, the more he seems to be proving himself to Gallant. Gallant is not normally one to single out players’ deficiencies, especially when they remain an issue, so for him to consistently be willing to talk about Pirri’s improved strength and stamina, he must really believe it. 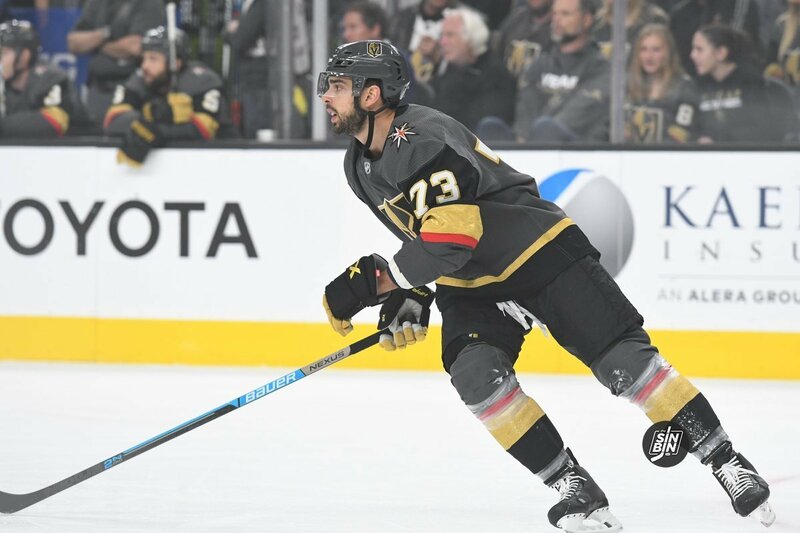 Pirri has been an X-factor for the Golden Knights to this point stepping in for Max Pacioretty and Reilly Smith, but where he can really make a massive difference is if he can have the same impact playing with Cody Eakin and Ryan Carpenter. Previously, it didn’t look like Gallant would ever allow that to happen, now, he might, and the Golden Knights might end up way better off because of it. I can’t see Pirri clearing waivers again considering how improved he has been looking since he came up this year. Especially with Chia mortgaging the Oilers’ future to try and squeak into the playoffs, you’d have to imagine he’d jump at the chance to pick up a scoring threat like Pirri for free.